Actually, these gum trees are just across the road from the Tea Garden in the park. 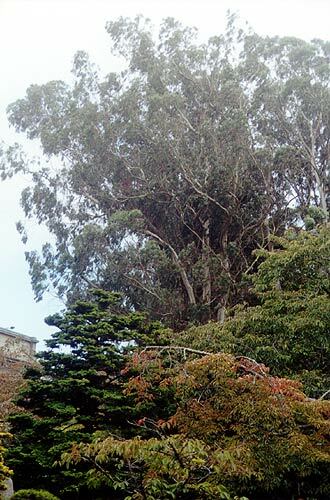 It was surprising just how many gum trees there are in San Francisco. Many years ago, the Golden Gate Park and other areas near the coast were simply barren sand dunes. Thousands upon thousands of hardy eucalyptus trees were planted to stabilise the dunes and help to turn the area into the thick forest that it is today. It seems that many local people have a love/hate relationship with these trees. They have been useful, but they are now becoming a pest as they are invading native forests.